Provided you’ve got the loot, this is a superb one-stop ambience shop. Increasingly, delay pedals seek to bend to guitarists’ every whim - with multiple modes, modulation and pitch-shifting now par for the course. 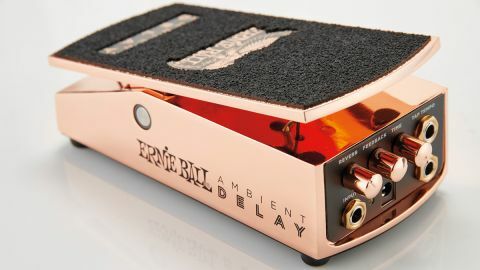 But with its latest pedal, Ernie Ball has taken us on a different tack by offering just a single delay and reverb mode with full-sized expression control modelled on EB’s famous volume pedal design. The Ambient Delay features three knobs: time and feedback, to tweak the digital delay (with the option of an external tap tempo footswitch); plus reverb, which adjusts the level of an all-purpose plate reverb. The overall level of the combined effects is handled by the big ol’ treadle, and offers up a host of new sonic opportunities. By keeping knob twiddling to a minimum, Ernie Ball invites a fresh approach to delay. At its most basic, you can easily get a ducking delay (where repeats cut out while you’re playing and resume when you stop), but you can also use it to fade in an effected part to build to huge crescendos, or dramatically cut trails. Since the pedal’s always on, courtesy of a transparent buffer circuit, you can dial in the ambience on the fly, too. We love what EB has done here. There’s a huge amount of potential, and the overall voicing is spot-on. It’s a shame the delay can’t be dialled out completely to make full use of the reverb, and the pedal is expensive, given you can get a multi-function stompbox and expression pedal for less. Provided you’ve got the loot, this is a superb one-stop ambience shop.